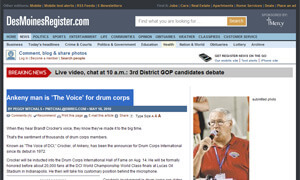 The Des Moines Register features an article today on Drum Corps International World Championships announcer Brandt Crocker and his recent induction into the DCI Hall of Fame. Crocker has been behind the microphone at the World Championships since 1972, an accomplishment he doesn't take for granted. "I figure as long as my health holds out, if I can continue to contribute, I want to be there," he says in the article. Read the article on DesMoinesRegister.com. Listen to an interview with Crocker in this recent Field Pass podcast.